A new probe designed specifically to take a deep view of a damaged nuclear reactor at the Fukushima plant was unveiled by Toshiba earlier today. Regrettably, it looks too cute to die. As the Associated Press reports, Toshiba’s energy systems unit developed the 42-foot-long, snake-like probe with help from the International Research Institute for Nuclear Decommissioning. The contraption consists of a long telescopic pipe with a pan-tilt camera affixed at the front. It was unveiled to reporters earlier today. 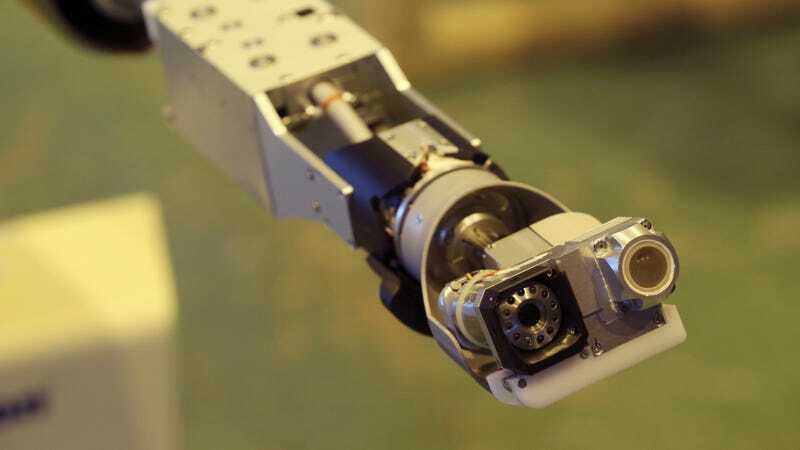 The device will be used to explore Fukushima’s highly radioactive Unit 2 primary containment vessel, where the extent of melted fuel damage is still not completely known. It’s designed to provide clean-up officials with a deep view of the damaged reactor. Details are thin, but based on the photos it looks like a remotely operated vehicle will be used to push the probe forward into the containment vessel. Once inside, the face-like, two-eyed pan-tilt camera will look around for signs of melted fuel. It has no mouth, so we won’t be able to hear it scream. The Fukushima plant suffered triple meltdowns in 2011 following a devastating earthquake and tsunami. The decommissioning process, which is expected to last until the 2050s, can’t get started until a full understanding of the plant’s condition is known. Work on reactor 3 is expected to begin next year, with efforts to extract the highly radioactive spent fuel in the cooling pools of reactors 1 and 2 scheduled to start in 2023. But much of this is contingent on clean-up crews having a clearer picture of the conditions inside. The intense radiation is making it difficult for survey teams to explore the beleaguered plant. But this new probe (fingers crossed) should help plant officials move things forward. Information about the melted fuel within will inform efforts to develop the right method and technology for the removal and containment of radioactive materials. This new probe will have to survive intense levels of radiation near the melted fuel. In early 2017, a robot was sent in to inspect reactor 2, and it went dark after just a few minutes.